DES MOINES – The Iowa Barnstormers are proud to partner with the Kiwanis Miracle League at Principal Park Field once again this season. 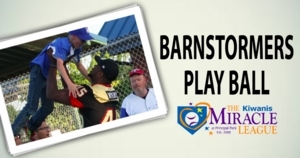 Barnstormers players and coaches will participate in two Kiwanis Miracle League games this Thursday, May 18. Thursday, May 18 will be Iowa Barnstormers Night with the Kiwanis Miracle League of Des Moines. With two games scheduled at Principal Park Field, members of the Iowa Barnstormers indoor football team will pair up with players of the Miracle League for a memorable night of baseball. Games are scheduled for 6:00 p.m. and 7:00 p.m. Free admission and parking will be available for the event along with open concessions. The Iowa Barnstormers return home this Friday, May 26 as they face off against the Green Bay Blizzard. Tickets are available today starting as low as $12 per seat by calling the Barnstormers at 515-633-2255 or visiting www.theiowabarnstormers.com.